To compete with cellular operators' 3G and 4G internet services; PTCL successfully launched its 4G wireless broadband internet services in Pakistan. PTCL branded its 36-Mbps 4G wireless broadband internet as "CharJi EVO". EVO CharJi Devices ranging from dongles to MiFi CharJi EVO Clouds. 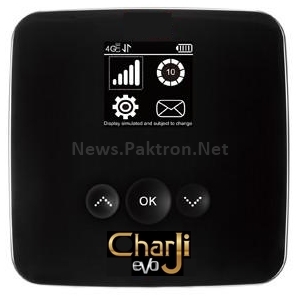 EVO CharJi is a wireless broadband service, just like PTCL's EVO and Wingle wireless internet service. Initial launch of this 4G LTE service is in Islamabad, Rawalpindi, Lahore and Karachi. The maximum speed you can get on this service is upto 36-Mbps and in out of 4G coverage areas you can get normal EVO speeds i.e 3.1-Mbps and 9.3-Mbps. So, this is a news from PTCL about CharJi EVO 36-Mbps Device.